Teddy is a fictional character in the movie WestWorld. It’s an amazing show if you haven’t watched it or haven’t had a chance. Anthony Hopkins is in it, how can you not enjoy it? Teddy is also a host in the rich people’s paradise where actions do not have any consequences. The visitors cannot die even if they are shot. Teddy lives in a continuous loop and plays the galant hero for Dolores. He’s always saving her and protects her from rapists and murderers. Teddy is the love of Dolores’s life. Dolores thought Teddy was too weak minded because he couldn’t be ruthless and kill, so she changed his programming. He became a ruthless killer and he couldn’t live with the fact that Dolores changed his code and committed suicide in front of her. It was a very sad end to his character. I really liked Teddy too! 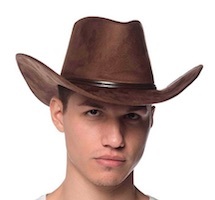 Click here for more WestWorld costumes. 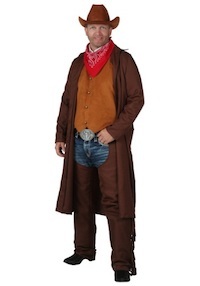 Find WestWorld Teddy costume ideas for adults. 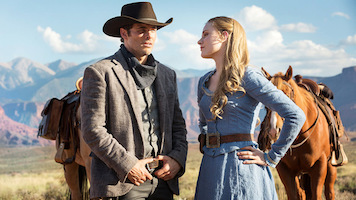 This costume is best paired with Dolores, or any other hosts in Westworld. You need to get ready to protect Dolores for all the evils out there. Be ready to take your fate in your hands. Find Teddy’s deluxe cowboy hat. Click here to get Teddy Costume Hat.